Heavy Rainfall Warning has been issued by the Indian Meteorological department in the souther coast of Kerala. Rainfall at most places with heavy to very heavy rainfall at a few places and isolated extremely heavy falls very likely over Lakshadweep area during next 48 hours. Heavy rainfall (7-11cm in 24 hrs) is most likely to occur at a few places in South Kerala till the morning of 2nd December 2017. Squally weather with wind speed reaching 65 to 75 kmph gusting to 85 kmph very likely along and off south Kerala coasts, strong winds from East/Southeast direction speed occasionally reaching 45-55 kmph likely along off North Kerala coast and from Northwest /North direction over Lakshadweep area till 1400 IST on 01.12.2017. Fishermen are advised not to venture in to the sea. 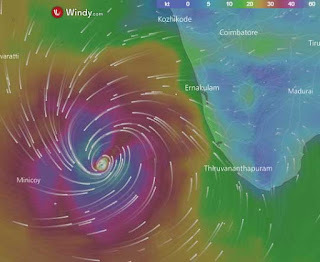 ♦ Gale wind speed reaching 80­90 kmph gusting to 100 kmph very likely over & around Lakshadweep Islands. 50 kmph very likely around Andaman & Nicobar Islands and adjoining Seas. ♦ Sea conditions very likely to be very rough to high along and off south Kerala and high around Lakshadweep Islands. while venturing into Sea around Andaman & Nicobar Islands. ♦ Dense to very dense fog at isolated places very likely over Assam & Meghalaya and Nagaland, Manipur, Mizoram & Tripura. 02 December (Day 3):♦ Heavy rain very likely at isolated places over Tamilnadu & Puducherry, Lakshadweep and Andaman & Nicobar Islands. ♦ Squally winds speed reaching 35­45 kmph gusting to 55 kmph very likely around Andaman & Nicobar Islands and adjoining seas. ♦ Fishermen are advised to be cautious while venturing into Sea around Andaman & Nicobar Islands.